The Super Bowl is arguably the most exciting event for football fans across the country. The Super Bowl has been around since 1967. It’s the second biggest eating day of the year for Americans. Some tickets to the Super Bowl can cost nearly $100,000. Every February, talk of the Super Bowl is pretty much inescapable. And the 2019 Super Bowl is no exception. Everywhere you turn, football fans are discussing who will win, who will perform, and which ads will have everyone talking the next day. So, what else is there to learn about the big game if it’s all anyone can talk about? There are actually a few little-known facts about the Super Bowl. Whether you’re rooting for the Patriots or the Rams, you probably didn’t know these interesting facts. In the very first Super Bowl, the Green Bay Packers beat the Kansas City Chiefs, 35-10, at the Los Angeles Memorial Coliseum on January 15, 1967. Sixty million people tuned in for the first broadcast, a number that has since nearly doubled. After their win, each player on the Packers team took home a $15,000 bonus. In comparison, every Patriots player received a $107,000 bonus for their win in the 2017 Super Bowl. Super Bowl Sunday is the second biggest eating day of the year for Americans. Even if you’re not a sports fan, you’re probably heading to the Super Bowl parties for the food. Chances are you’re eating at least a few of the 1.25 billion chicken wings consumed on Super Bowl Sunday. One hundred twenty million pounds of avocado, four million pizzas, and 50 million cases of beer are all scarfed and guzzled on what is the second biggest eating day of the year— Thanksgiving is the first. Many NFL teams have never won the Super Bowl. According to Business Insider, 12 NFL teams have never taken home the rings, the bonuses, or the big W from the Super Bowl. The Eagles just recently took themselves off of the list with their 2018 Super Bowl win. Meanwhile, teams like the Cleveland Browns, the Buffalo Bills, and the San Diego Chargers have never won the big game. Super Bowl ads are extremely expensive, thanks to the audience the event draws. As of 2017, Super Bowl ads cost advertisers about $5 million for 30-second spots. When the Bowl first began, ads were a much more conservative $40,000, but they’ve climbed in cost every year since then. The reason these ads are so expensive is because the games draw in extremely high viewership, which can potentially lead to revenue. The advertisements have also become a heavily valued tradition over the years, each more elaborate than the next. Super Bowl XLIX is the most-watched Super Bowl of all time, bringing in 114.4 million views. Most of the quarterbacks in Super Bowl history come from the same 11 schools. Though their teams may differ, many Super Bowl quarterbacks share the same alma mater. As of 2017, universities Notre Dame, Michigan, and Stanford were tied for the most alumni with Super Bowl appearances, each with seven. Purdue came in second with six. Tied for third place were Louisiana Tech, UCLA, Alabama, Tennessee, Navy, California, and Miami. Tom Brady is the most successful quarterback in Super Bowl history. New England Patriots fans may know this, but 40-year-old Patriots quarterback Tom Brady has had the most Super Bowl appearances and wins of any quarterback in history. The NFL uses roman numerals to avoid confusion about when the Super Bowl is played. Lamar Hunt, the former owner of the Kansas City Chiefs, came up with the roman numerals system after NFL officials wanted to avoid confusion based on the fact that the championship game is played the year after the corresponding season has ended. Football is usually played beginning in the autumn of one year, then the Super Bowl falls in the beginning of the next year. The tradition began with Super Bowl V in 1971 and has continued ever since. Super Bowl tickets are only getting more expensive and can cost more than the average American’s annual salary. For this year’s Super Bowl, the cheapest ticket costs over $2,900. From there, the average ticket price is about $5,682. The most expensive tickets cost upwards of $93,000. By comparison, the median salary of Americans working 40 hours a week is $44,148, which is about less than half of the price of the most expensive ticket. The NFL does not pay bands or artists to perform at the halftime show. There have been contradictory rumors for years that halftime performers are either paid exorbitant amounts or that the performers pay the NFL a huge sum to perform. Both of these assumptions are incorrect. According to the New York Times, the NFL does not pay an “appearance fee” but does cover all expenses for the performer(s) as well as the cost of things like lighting, bodyguards, and stagehands. But, as Upvenue.com pointed out, the idea of a performer paying isn’t necessarily true either. The NFL allegedly asks performers to ensure their performance offer with cash, but Katy Perry confirmed that she did not pay to perform at the Super Bowl in 2016. There are a lot of footballs used during the big game, and the inspection process is lengthy. One of the NFL’s top concerns is making sure that footballs are properly inflated in order to avoid cheating. For regular games, each team typically breaks in 12 footballs ahead of time that are then used during the game, according to USA Today. These footballs are presented to officials and inspected two hours and 15 minutes before the game, where they are tested for air pressure and proper protocol. During Super Bowl XLIX, each team got 54 balls, making a total of 108 balls. Two brothers once competed against each other as Super Bowl team coaches. In 2013’s Super Bowl XLVII, Jim and John Harbaugh, of the San Francisco 49ers and the Baltimore Ravens respectively, made history as the first brothers to compete against each other as coaches. A lot of thought goes into the Super Bowl location, and the venue is determined way in advance. There are several crucial factors in choosing where to play Super Bowl games. The NFL considers things like weather, the quality of the stadium, and the accommodations of the location. 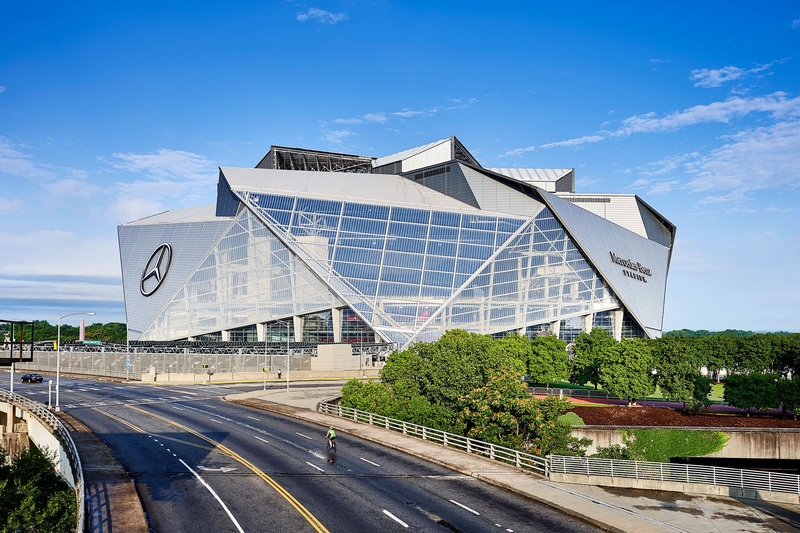 In 2019, the Super Bowl will be at the Mercedes-Benz Stadium in Atlanta, Georgia. The next year in 2020, the game will be at the Hard Rock Stadium in Miami Gardens, Florida. Following that, in the year 2021, the Super Bowl will be at the Raymond James Stadium in Tampa, Florida. The LA Stadium at Hollywood Park in Los Angeles, California will be the site of the Super Bowl in 2022.